I’ve wanted to make a BBQ Chicken “bowl” meal for a couple weeks now. 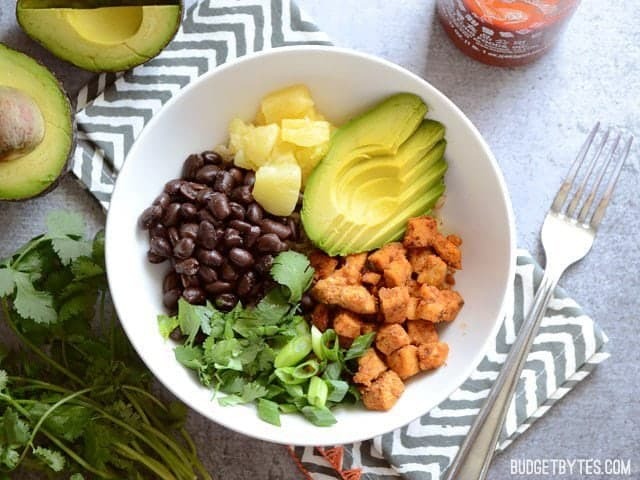 I love bowl meals because they are easy to prepare, hold up well in the fridge, and offer a great variety of flavors and textures. 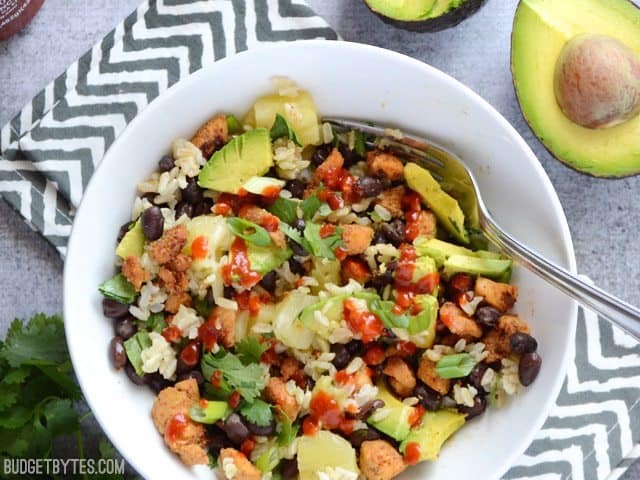 If you still feel the Sweet n’ Spicy Chicken Bowl needs a little sauciness and you’re not doing the Go Sugar Free course, you can drizzle a little of your favorite BBQ sauce, sriracha, or even a little ranch dressing over the top. Yes, ranch may sound strange, but it goes pretty well with all of these ingredients, just go lightly with it. And if you are doing Go Sugar Free? A little dollop of sour cream might be pretty good. I just let the creaminess of the avocado and juicy pineapple act as the dressing, so to speak. I was lucky enough to get an avocado on sale for $0.98, but if they’re a little pricy in your area, you can try using a little shredded cheese instead. I would suggest something creamy like Monterrey Jack or spicy Pepper Jack. 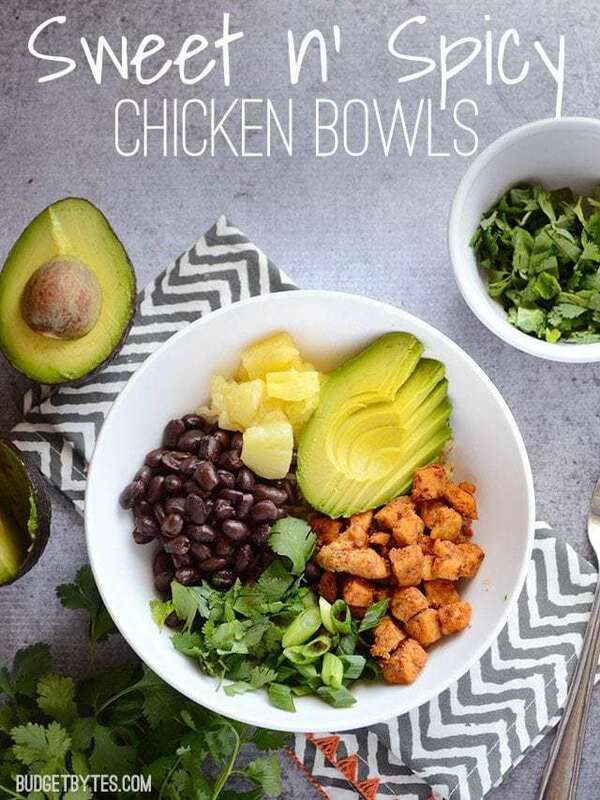 These Sweet n' Spicy Chicken Bowls assemble quickly and provide a lot of flavor, color, and texture. 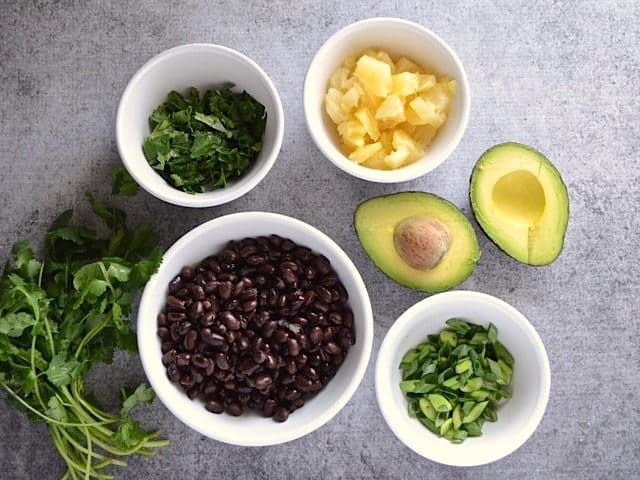 Low sugar, high fiber, and loaded with deliciousness! Begin by cooking the rice. Combine the uncooked rice and chicken broth in a small pot. Place a lid on top and bring to a boil over high heat. As soon as it reaches a full boil, turn the heat down to low and let simmer for 25 minutes. After 25 minutes, turn the heat off and let it sit undisturbed, with the lid in place for 10 minutes. Fluff with a fork. 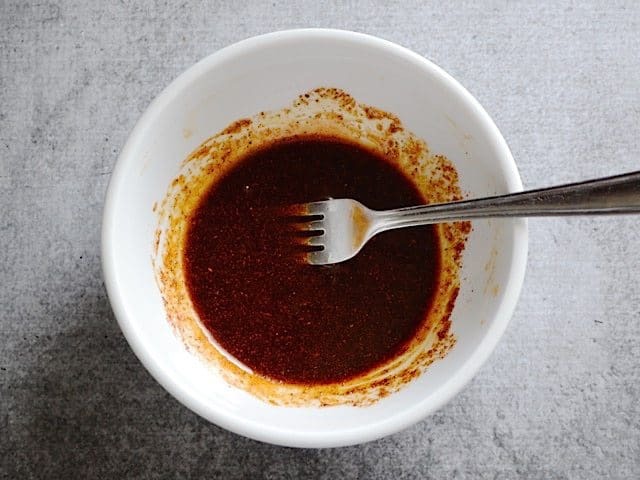 Prepare the honey spice mix by combining the chili powder cumin, garlic, smoked paprika, cayenne, freshly cracked pepper, salt, honey, olive oil, and apple cider vinegar in a bowl. 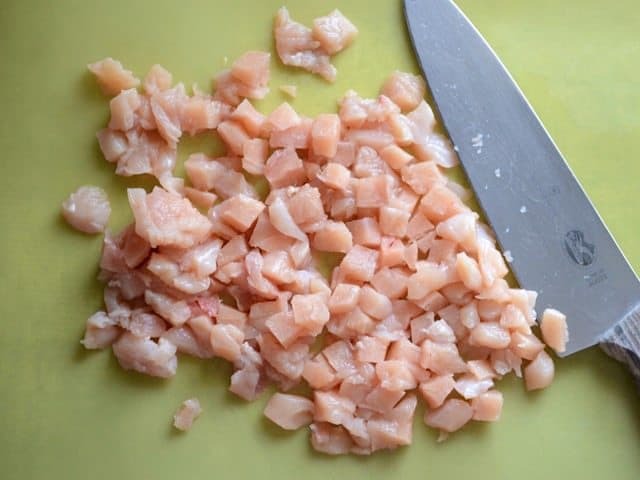 Chop the chicken breast into small pieces. Add it to the bowl with the honey spice mix and toss to coat. Set the seasoned meat aside while you prepare the rest of the bowl ingredients. Rinse and drain the black beans. Drain the pineapple, then chop the tidbits into smaller pieces. Slice the green onions. Rinse and roughly chop the cilantro. Cut the avocado in half, then use a pairing knife to slice or cube the flesh. Heat a large non-stick skillet over medium heat. Add the chopped and seasoned chicken pieces and sauté until cooked through and slightly browned (5-7 minutes). 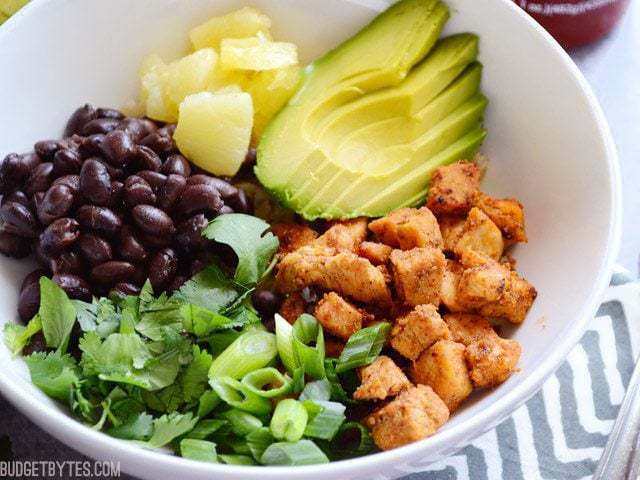 Build the bowls by adding 3/4 cup cooked rice to each bowl, followed by 1/4 of each of the following: cooked chicken, black beans, pineapple, avocado, green onions, and cilantro. *The price for this rice is very high, but it's some leftover organic brown jasmine rice that I had purchased previously. **I only buy my chicken breasts when they go on sale for $1.99/lb. (which they do about once a month or two) at my local grocery store. It then gets stored in the freezer until I'm ready to use it. Start by cooking your rice, because the rest of the bowl can be prepared and ready to assemble by the time the rice finishes cooking. 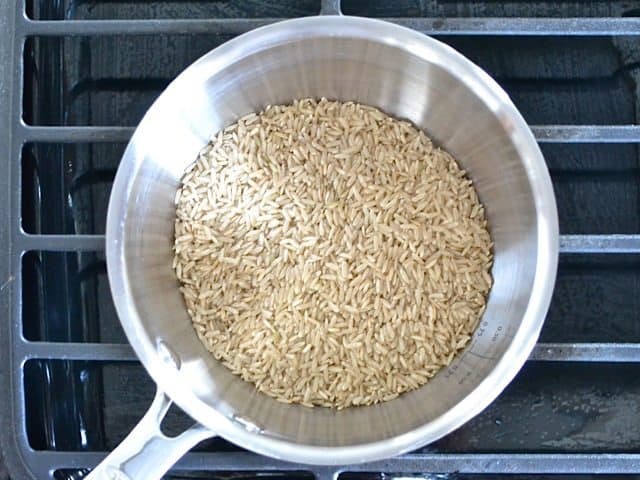 Place 1 cup brown rice in a small pot and add 1 3/4 cup chicken broth. Place a lid on top and bring it to a boil over high heat. As soon as it reaches a full boil, turn the heat down to low and let it simmer there for 25 minutes. After 25 minutes, turn the heat off and let it rest with the lid in place for another 10 minutes. Then, fluff with a fork. 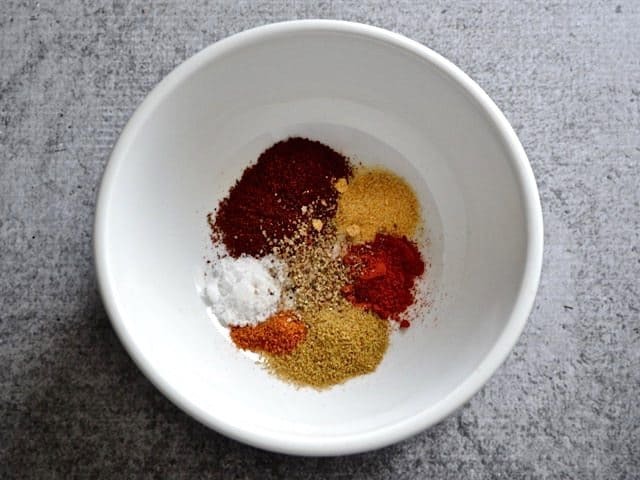 While the rice is doing its thing, make the spice mix for the chicken. 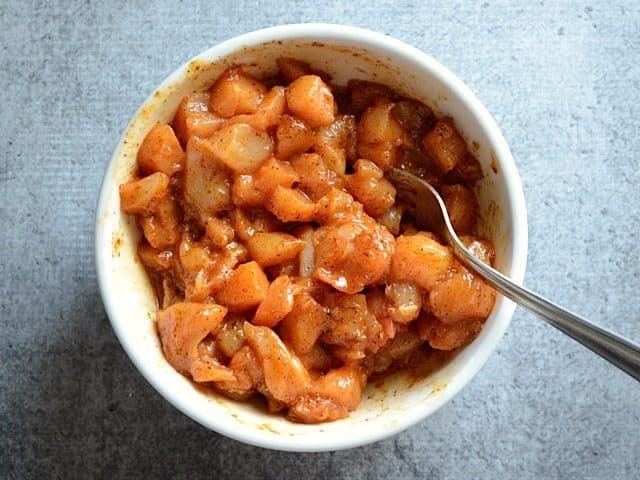 Combine 1 tsp mild chili powder, 1/2 tsp cumin, 1/4 tsp garlic powder, 1/4 tsp smoked paprika, 1/8 tsp cayenne pepper, some freshly cracked pepper, and 1/4 tsp salt in a bowl. Also add 1 Tbsp olive oil, 1 Tbsp honey, and 1/2 tsp apple cider vinegar. Stir to combine. (If you don’t have honey, brown sugar works well, too). How do you spread one single chicken breast out over four servings? Chop it into tiny pieces! It really does help. I wish I would have taken a “before” photo of the chicken so you could see how small it was compared to the large quantity that it looks like now. The chicken breast was about 3/4 lb. Add the chopped chicken to the spice mix and stir until it’s all coated. Set that aside while you prepare the rest of the toppings. 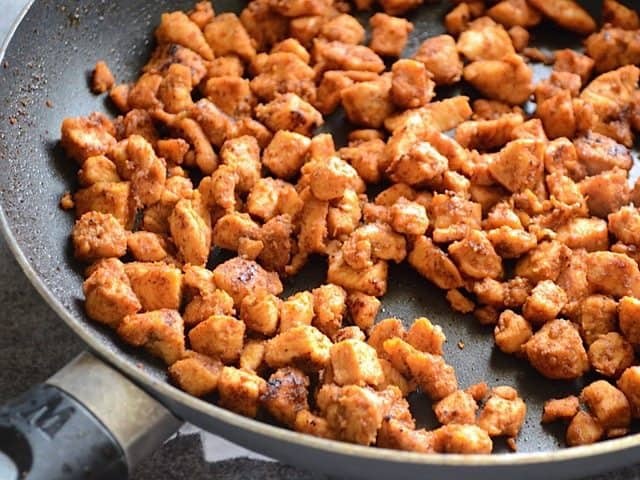 If you don’t want to make your own spice mix and are not worried about sugar content, you can actually just use bottled BBQ sauce to coat the chicken. So, you’ll also need: 1 15oz. can of black beans (rinsed and drained), 1 8oz. can of pineapple tidbits in juice (drained and roughly chopped into smaller pieces), 2 green onions (sliced), 1/4 bunch of cilantro (rinse and roughly chopped), and one avocado (sliced). Finally, it’s time to cook the chicken. Because it’s in such small pieces, it cooks quite quickly. Heat a large skillet over medium heat. I used non-stick skillet because the sugar in the spice mix can tend to stick. The spice mix already has some oil in it, so with a non-stick I didn’t have to add any more. Add the chicken to the hot skillet and sauté until the pieces are cooked through and only slightly browned (5-7 minutes). The small pieces have the luxury of cooking quickly, but that also means they can dry out quickly. So, just let them brown a little. Now you have all your ingredients ready. Rice is cooked, toppings are chopped, and chicken is sautéed. 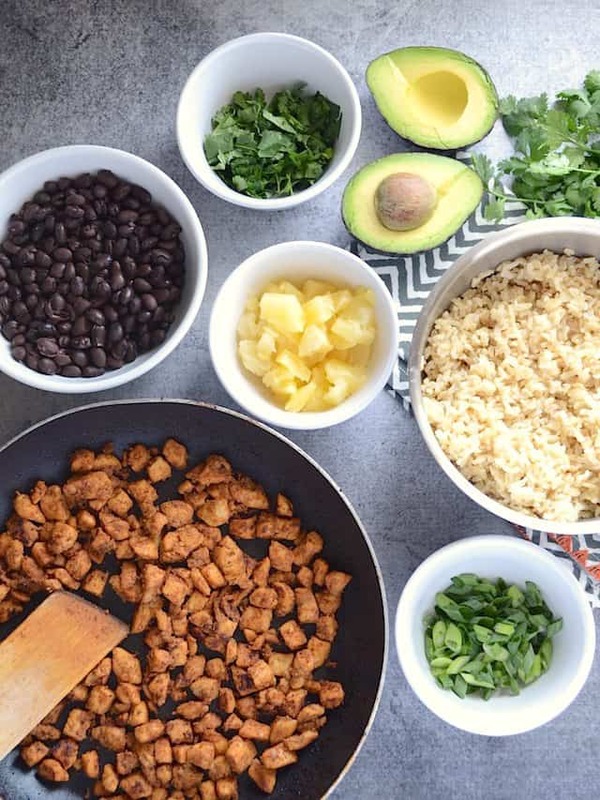 It’s time to assemble the Sweet n’ Spicy Chicken Bowls. 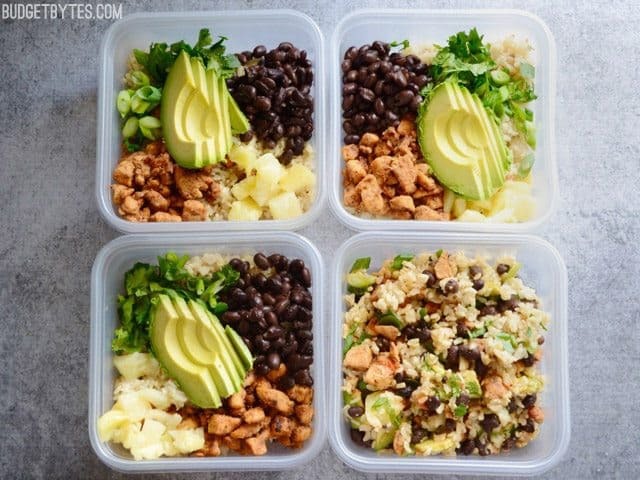 Add 3/4 cup of cooked rice to the bottom of each bowl, then add 1/4 of the black beans, cooked chicken, pineapple, cilantro, green onions, and avocado. I can’t lie. I added a little drizzle of sriracha. Sriracha has sugar too, so I’m a little off the wagon here. Still a super healthy meal, so I feel good! I do find the bowl a little dry for my taste, especially as leftovers, so I sometimes leave out the black beans and add in another veggie with some moisture (sauteed zucchini is a good one). Thanks for this awesome recipe – definitely part of the regular rotation at my house! This is a family favorite in my house. I double the chicken/marinade but cook it in batches and double the pineapple and avocado (since those are the favorite toppings). A winner! Made this tonight but subbed tofu for the chicken to make it vegetarian. OMG. Legit think I could’ve fooled a meat eater. It certainly *looked* like the chicken in your photos. And it tasted sooooo good. The only change I made to the recipe (besides obviously not using chicken) was I omitted the oil from the marinade and just used water in its place. I marinated the tofu after pressing and cutting it. Then shook it in cornstarch and pan-fried it. Heaveennnnnnnn. This was fantastic! A refreshing, healthy way to start the summer. I doubled the chicken and the marinade and the proportions seemed to come out just right. I also stored the leftovers in one Tupperware to be reheated and one to leave cold. 5 stars! The whole fam loved this!